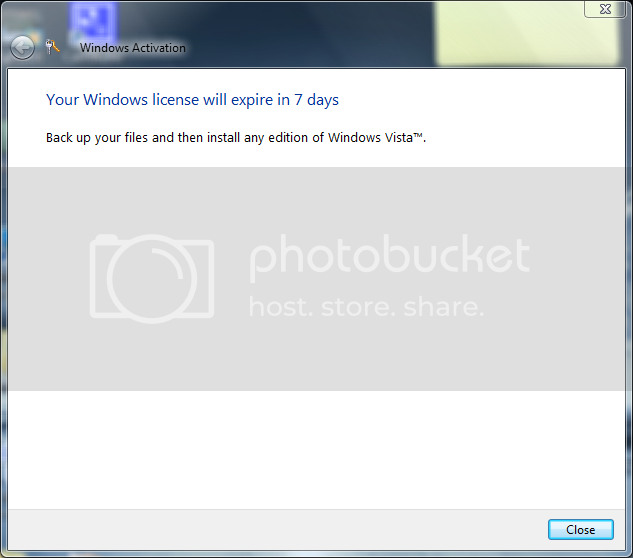 "Your windows license will expire in 7days?" What?! Discussion in 'Windows Vista' started by nappymonster, Mar 31, 2008. 1) Screen shot can be viewed here. 2) This is a perfectly legit copy of vista. 5) Won't re-installing it give me an identical error later on? Whether it be a week, two weeks, a month or six months, i'm not regularly going to do this! 6) Vista has been installed for over a year i think on this PC, so it's quite annoying! Have you made any hardware changes lately?? Sometimes this can remove activation from Vista. Also, since this is a legit copy of Windows, you should have no problem contacting Microsoft and receiving another activation code. Dosn't seem right. That is the message you would normally receive on a Beta release. Have you tried applying for a new key through the Control Panel (Clasic view - System - at the bootom "Apply for new product key"
-It might be confused with SP1 beta, and that's expiring in 7 days. -That they will get us a new product key. You could also uninstall the SP1 Beta, of course, perhaps that would be enough? I had exactly the same problem. Check out the following Microsoft Knowledge Base Article, which ecplains how to fix.